Disclosure of material connection- I received a copy of the book from the publisher via Netgalley. I was not required to write a positive review and all opinions stated are 100% my own. Move over Junie B. Jones! Get to know Piper Green as she discovers the ordinary magic right outside her front door. 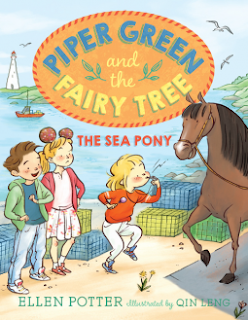 Piper Green is in for another adventure when she finds an unusual whistle hidden inside the Fairy Tree in her front yard. But Piper doesn't want a whistle... she wants a pony! On a trip with her dad to check the family's lobster traps, the whistle attracts the attention of an unexpected friend. Could the fairy whistle working its magic after all? It took my 8 year old a while to get into reading. When she finally did it was all Junie B. Jones all of the time. She has read every book in that series about 10 ten times by now and I thought Piper Green sounded like another series she could get into. She read this book in about half an hour. She said she liked the part at the beginning when Piper was making her brother cinnamon snakes when he didn't feel well, when she gets to ride a pony and she also loves that Piper rides a boat to school. Her verdict was that Piper Green is not quite Junie B. but she did enjoy this book and I think she would be open to trying more in the series.